Compare discounts for Hotels Motels Resorts in Key Largo, Florida! Named 'Cayo Largo', or 'Long Key' in Spanish, Key Largo is the gateway to the Florida Keys, the lovely chain of islands stretching for a hundred miles off the coast of southern Florida. Nicknamed 'Dive Capital of the World', Key Largo, only 55 miles south of Miami, is considered by many to be one of the best places to dive in the world. The natural reefs at the John Pennekamp Coral Reef State Park, the underwater caves of French Reef, a variety of marine life at Key Largo National Marine Sanctuary, sunken ships and clear waters make Key Largo a paradise for divers and snorkelers. For less active travelers whose favorite pastime is doing nothing, Key Largo has the relaxed atmosphere of a tropical island. Accommodation options include upscale resorts as well as budget motels, all of which are within walking distance of the beach. Note: Lists are not identical. 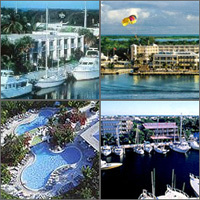 Different sites offer different accommodation options for Key Largo. The Marriott Bay Beach Resort is a deluxe hotel located on the Florida Bay of beautiful Key Largo, just 55 minutes from Miami International Airport. This delightful property offers guests the perfect combination of high quality service and comfortable accommodations at reasonable prices that make Marriott one of the most popular hotel chains in the world. The Marina Del Mar is a first class resort with a 37 skip marina which leads to the Atlantic Ocean, John Pennekamp Coral Reef Park and the Florida Keys National Marine Sanctuary. Each of the beautiful, waterfront rooms feature amenities that are sure to please and make for a pleasant and enjoyable stay. The Ramada Resort and Marina is first class hotel located 55 minutes south of Miami International Airport in Key Largo's deep water marina on the very first island of the Florida Keys. The Westin Beach Resort is a deluxe hotel located 2 hours from Miami International Airport. The hotel is located on a picturesque natural hard wood hammock on the only white sand beach in Key Largo and is approximately 60 miles south of Miami and 97 miles north of Key West. The spacious guest rooms are inspiring, appointed with comfortable tropical furnishings, thoughtful amenities and modern conveniences. The Holiday Inn Key Largo is a first class hotel located just a 55 minute drive south of Miami International Airport, on Key Largo's deep water marina. Close by you will find the Underwater Pennekamp Coral Reef State Park, Swimming with the Dolphins and many other watersports opportunities. The Ocean Pointe Suites at Key Largo is a gated, 60-acre resort with a marina and sand beach. The Mariner's Club Key Largo is an oceanfront property at the gateway to the Florida Keys, overlooking John Pennekamp Coral Reef State Park and Molasses Reef. The Travelodge Key Largo is a two story, Caribbean style structure surrounding a tropical courtyard and pool. Best Western Suites at Key Largo will take you away from it all without giving up life's luxuries - the tropical beauty of Key Largo with the luxury of two-level suites. The Key Largo Inn is a 2 story Caribbean style hotel surrounding a tropical courtyard and pool. All rooms are non-smoking and access the pool and courtyard area. The Key Largo Bayside Resort is a modern first-class, low-rise resort centrally located within walking distance to many restaurants and shops. The Howard Johnson Resort is a tourist class hotel located at mile marker 102 in Key Largo. The guest rooms are outfitted with one king size bed or two double size beds and either a private balcony or patio that opens directly onto the pool and beach areas, or onto the surrounding tropical gardens.